After the spectacular success of the Commodore 64, CBM barely knew what to do with themselves. They created the Commodore 128 that combined C64 functionality with unique high powered modes of its own, but it didn't really work out. 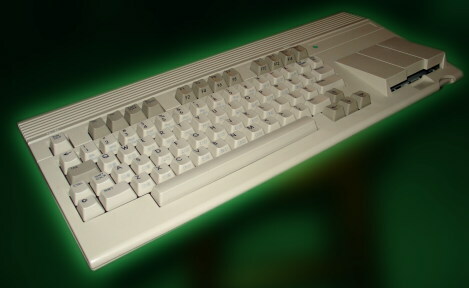 Of course there was the mighty series of Amiga computers from the mid 80's onwards, but Commodore was convinced they could still make good use of the popular C64 technology. Enter the Commodore 65; in many ways like a C64 that went to "11". It featured a sleek new design, two SID audio chips, a built in 3.5" floppy drive, better graphics abilities, expansion to 8 megs of RAM, and a flat bit to rest your coffee on. Some working prototypes were made in 1990-91, and when Commodore was liquidated after their bankruptcy in '94, some of these machines got out. No one knows exactly how many are out there; estimates range from 50 to several hundred. This particular unit is owned by Jason Compton, well known Amiga fan, editor of Amiga Report (a hyperlinked online magazine pre-HTML... wow! ), and all around super talent. He may show it off at the ECCC Commodore show that's coming up September 27 this year in suburban Chicago (check out the awesome guest list of C64 luminaries!). After speaking with Jason about the C65 it seems clear that while the machine had a lot of things going for it, it was simply too late to market. By 1991 Nintendo & the PC were leading gaming and computing away from the standards that the original C64 had set. With millions of Commodore 64's sold in the world, it seems like there could have been interest in an improved version like the 65. The C65 went unreleased not because ol' "chicken lips" (the unfortunate nickname for Commodore's logo) was too chicken to offer new products, but because the C65 simply would not have sold in the early 90's. Especially not at the $300-400 projected price. Sadly the evolutionary C65 will go down in computing history as another unfortunate casualty of Commodore's legendary lack of insight. I'm going to September's Chicago-area C64 show, wanna come? Commodore 1702 monitor - my favorite CRT! C64 Laptop... er... PDA... I don't care - I want one! In the 1960's, the folks behind the scenes of the then-new Doctor Who were really looking to make their mark in television. Scoffers can point their fingers at the wobbly sets and fluffed lines, but the extraordinary theme song remains a spooky and unequaled classic to this day. 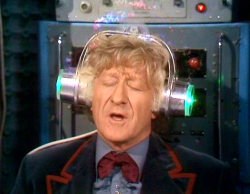 Even people who don't watch Who will wail out "oooooo-WEEEEEE-ooooooo" at the mention of the show's title. 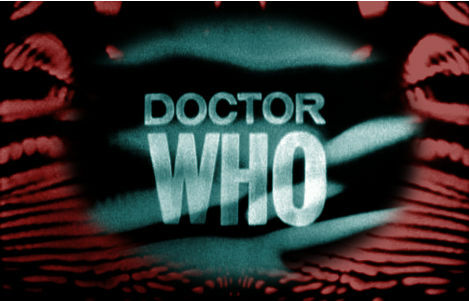 The theme song's melody was composed by BBC composer Ron Grainer, but the signature sound of the piece is thanks to Delia Derbyshire. Derbyshire was a composer at the BBC's Radiophonic Workshop, a department charged with innovating new audio for radio, and a crucial component in creating Doctor Who's otherworldly soundtracks. Derbyshire actually constructed the Who theme song out of separate bits of tape recorded using lots of non-musical gear. The result is one of the most recognizable pieces of Musique Concrète in the world. The GP2X was a popular little handheld released a few years ago. It's open-source background invited much hackery, so the little unit became home to countless classic video game console emulators, the mighty arcade emulator MAME, as well as providing support for Flash 7, MP3 and movie playback. There is even video output so you can play your arcade favorites and downloaded movies on your TV. The GP2X is back with a touchscreen and a new name - Wiz. Haughty jokes about the name aside, the unit is more powerful than its predecessors, and from the specs it sounds like it'll be easy for homebrew authors to port their GP2X apps to the Wiz. The pocket-sized arcade is expected to ship this October. We always wanted to review the GP2X here on Retro Thing since there are so many great retro-gaming applications available for it. A friend of mine did lend me his, but it had a serious bug that caused me to overwrite the firmware rendering his GP2X useless. I've read about the problem elsewhere, and this was early in the GP2X's life, but what causes me concern was that there was no way to return the unit for repair. I'd still like to review the new Wiz, but only once we see that there are some quality resellers who are willing to stand behind this promising product. Any GP2X owners out there? Are you going to get a new Wiz? Ever since we lost electronic music visionary Bob Moog in 2005, the Bob Moog Foundation has been working to preserve and share Moog's legacy. They recently opened their own YouTube channel. The videos available now offer remembrances of Moog and his work by modern masters of synthesis. After watching a few of these videos you can see the kind of impact Moog's inventions had, and the many ways that he touched both co-workers and friends. Since so many of Moog's inventions were happening at the same time as the video revolution, I hope that the Foundation will use the channel to share rare and unseen videos of Bob at work, notable performances, and perhaps some of the personal insights such as those he shared in the 2004 tribute film that bears his name. We've linked the Moog YouTube channel below, as well as the link to Moog's official MySpace page where you can pick up the Mooged Out tribute CD. 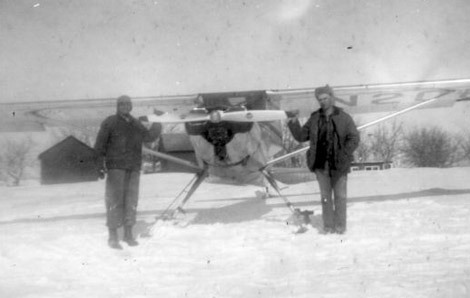 "For many years, I have had a picture of my father standing by an airplane--his airplane--on a snowy North Dakota day. I was fortunate enough to contact Rex Bradford, creator of, among several other games, the previously unreleased Kabobber for Atari 2600. I asked him several questions via email and he was very kind in thoroughly answering them. Rex Bradford: “I enjoyed working at Activision. Five of us had left Parker Brothers and had our own Massachusetts office, which afforded if anything a bit too much creative freedom. So I actually had only intermittent contact with the rest of Activision. I met Al Miller and Bob Whitehead and David Crane, but only briefly. I left there due to a combination of frustration at having Kabobber go unreleased, though I don't blame Activision for that (the game always felt a bit unfinished to me too, and also the Atari market was in freefall at that time). We've written about the fabulous handheld LED games of the late 70's before. I still have an electronic soccer game that I got as a promotional gift for opening a bank account when I was seven years old - an account I still use (a fact that I remind my bank of whenever they give me crappy service)! It's not just me who remembers those handhelds fondly. Before the concept of a portable cartridge gaming system came along, these LED games were the way to take your favorites with you. Retro-minded toymakers cashed in on the nostalgia of these games in recent years, but brought them back as LCD games - so you couldn't play in the dark anymore. 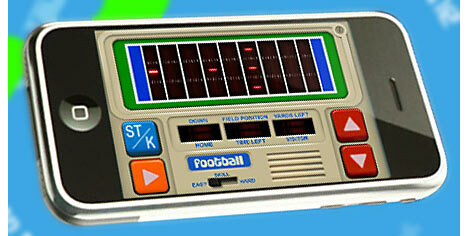 Enter LED Football for iPhone. It's coming soon, it's 99 cents, and you can play it in the murky back seat of your dad's Buick. Whew - 99 cents. That's even less than the original 70's handhelds cost at the flea market! Lots of creative people fall into the trap of putting off dream projects until some crucial piece of gear falls into their lap. That new guitar pedal or paint software or dual chrome exhaust is all we need to finally make our masterwork, right? This amateur film starts off that way. Sid Laverents gets a Roberts (AKA an Akai M-8) reel-to-reel tape recorder for Christmas in 1970, and he uses it to record a song that's been rattling around in his head. After a few minutes of introduction, "Multiple Sidosis" becomes one of the most amazing home movies ever. Ever. 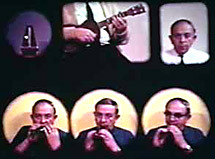 The movie not only shows Laverents using his new reel-to-reel to create a charming multi-layered version of "Nola" (by using the tape deck's sound-on-sound recording feature), but the film then turns into an elaborate and sophisticated multi-image performance film. For those accustomed to editing on a computer, it may be difficult to understand just what an undertaking this film was. Effects like this used to require an optical printer - a complex piece of professional movie studio effects gear. Laverents found a way to craft these effects at home, and have them somehow look slick and charming at the same time. Despite how labor intensive this film must have been, the spirit of fun and inspiration are in every scene. Click the movie below to watch the nine minute film. Even on a modern editing system, this would be a very complex project. Sid had something better at his disposal than a computer, a tape recorder, or a 16mm camera... He had his wits. The rewards for "Multiple Sidosis" stretch beyond scholarly infamy, and it's more than just a cult oddity. In 2000 the film was selected by the Library of Congress for preservation as being culturally significant (the same year as "Apocalypse Now" & "Shaft"). Better still - Sid can enjoy his notoriety in person. He just celebrated his 100th birthday, and he's still creating films. We can all take a page from Laverents' book (his autobiography is entitled "The First 90 Years Are the Hardest"), Sid has accomplished more than many people would in two centuries. You can buy "Multiple Sidosis" and other films directly from Laverents himself by following the link below. Happy Birthday, Sid! I have the same reel-to-reel recorder as the one featured in the film. Maybe one day I'll stop dreaming of all the gear I'll never have, and maybe - just maybe - I'll go and create something magnificent on my tape recorder too. 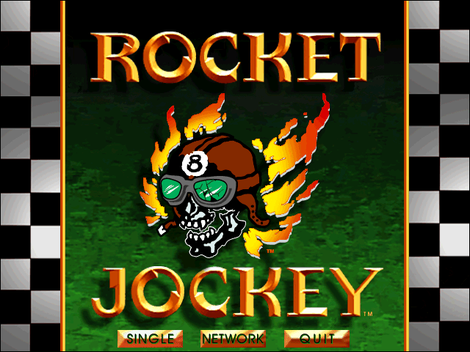 Released in 1996, Rocket Jockey for the PC isn't very retro but the game's setting, obscurity and cult following sure add volumes to its retro "cred". I spent many hours as a kid playing this with friends. Its bizarre concept and amazing music made it the kind of game that seemed to fascinate even my parents. I'll start by quoting the beginning of the beautiful poetry that adorns the back of the box, "It's your basic boy-meets-rocket, boy-loses-rocket, boy-gets-dragged-along-the-ground-and-crushed-against-wall-story." Oh yes, it goes on like that and it's a great little insight to this wonderful game. Rocket Jockey is a 3D third-person action game, developed by the sadly ill-fated Rocket Science Games, where you take the role of one who rides a motorcycle-like rocket equipped with 2 side grappling hooks. The game takes place in an alternate-history 1930s setting where such a fantastic thing is possible. After picking an appropriately silly-named jockey to play as, one of several awesomely designed rocket sleds and one of three sports (Rocket War, Rocket Racing and Rocket Ball), you'll soon be thrown into a sport, the likes of which you've never seen. I so want this for the corner of my office. The base looks like an old metal desk from my primary school, and it definitely belongs on a Constellation class starship. When anybody asks, I'll solemnly explain, "It's the first transistor-based differential equation analyzer, from 1959. And it's Polish." They'll nod in befuddlement and ask if it can play Spacewar, which of course it can't. 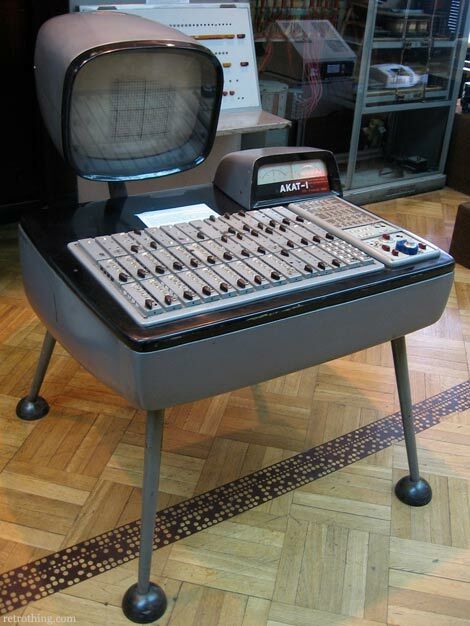 AKAT-1 is an analog computer. Back in the 1960s, this approach offered speed and acceptable accuracy without the complexity of digital logic.The result was a device that could solve relatively complex differential equations in real time, as long as you weren't after precise values. Alas, time has passed it by and it now leads a life of leisure at the Museum of Technology (Muzeum Techniki) in Warsaw, Poland. It's easy to dismiss analog computing as a dead end on the evolutionary tree of computational science, but countless analog music synthesizers remain sought-after for their warmth and instantaneous response. And, yes, each and every one is a real-time analog computer. 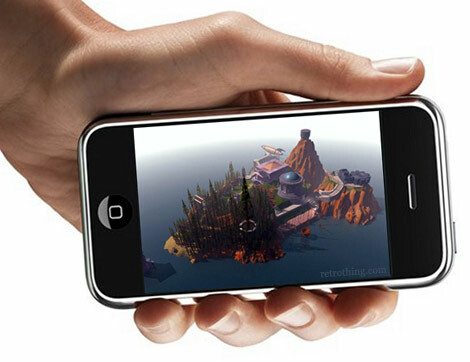 Cyan is working on an iPhone port of Myst, their groundbreaking first-person graphic adventure game. It makes sense; the 2500 images in the game were rendered on Mac Quadras and the first version (coded in HyperCard, no less!) 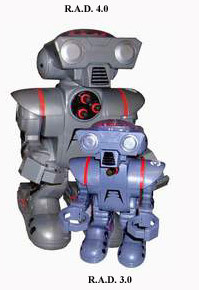 debuted on the Mac in late 1993. It went on to sell millions of copies, of which I own three. Odd, that. The struggling company let the news slip a couple of days ago in a status report, "This is a small project that probably a very few of you know about. We are porting Myst to the iPhone. Ok, before some of you start groaning, this is an outside funded project that is keeping a few developers employed... but it is really more than that. It is an interesting and fun project." Promisingly, company co-founder Rand Miller is one third of the tiny development team. 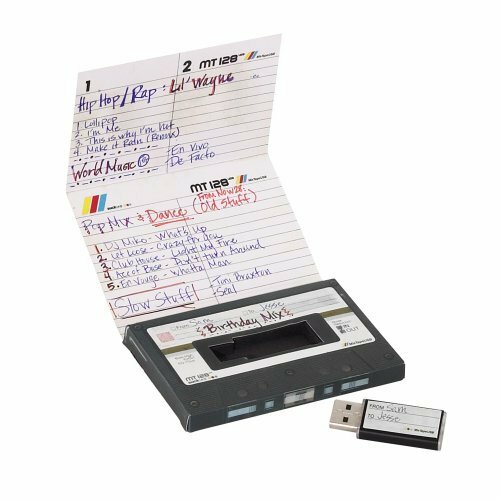 Mix tapes seem to carry a weight of almost archaeological significance. They are tiny time machines, placing you right back into the most important periods of your life. 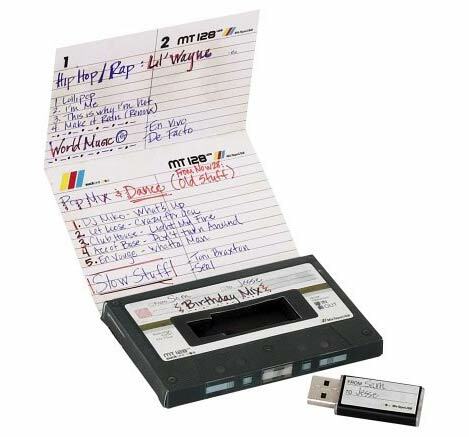 If you ever made a mix tape for someone else, you know how painstaking the song selection process was. Each one had to be precise and meaningful. I remember my friends taping songs from old records, using my dual cassette deck to record tracks off my other tapes, or - this is my favorite - taping the radio when I knew a certain song was coming on. It was a labor of love to be sure. The Mix Tape 64 MB Memory Stick plays off the idea, but this time, you simply use your computer to save songs directly to the memory stick. Then, you can place your creation in that familiar mix tape packaging and bestow it upon the lucky listener. Maybe now the painstaking part is finding that rare track to download. Having held onto my own priceless mix tapes for years, I think it is nice that they paid homage to a classic. Keytars are popping up everywhere, and now, they're not just in my dreams. 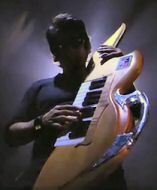 Bands like Cobra Starship, Shy Child, and Flight of the Conchords have each added keytars to their quiver of instruments. 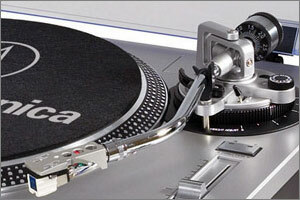 The Roland AX-7 is a modern classic, introduced in 2001. However, it does get some mixed reviews. What people do seem to really like is that it gives you the ability to play a stack of keyboards through one controller. Components like the expression bar and infamous D Beam also allow unique sound control and add to its guitarlike appeal. Plus, the fun factor is pretty high since you can jump around stage untethered, something a stuck-in-the-background keyboardist must appreciate. Irksome qualities include its lack of onboard sounds, the fact that its somewhat confusing to program, and its inability to change octaves quickly. 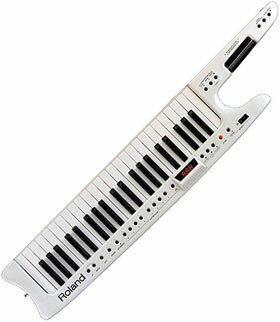 Roland discontinued this model in 2007, but they are out there, albeit elusive. Ebay had one up for sale today for around $1,000, but private sellers seem to set more reasonable prices. I found one for $800 here in the classifieds at Harmony Central. In any case, if you're searching for one, I salute you in your quest to become the Keytar Hero, and in the meantime, you can always splurge on a wicked Zen Riffer, Charles Tentindo's keytar-ish instrument that looks like it could shred itself. Once upon a time there was an action/puzzle game called Qix. It was a good and noble game and it met another action/puzzle game called Arkanoid. These two Taito games fell in love and a child game was conceived and born. 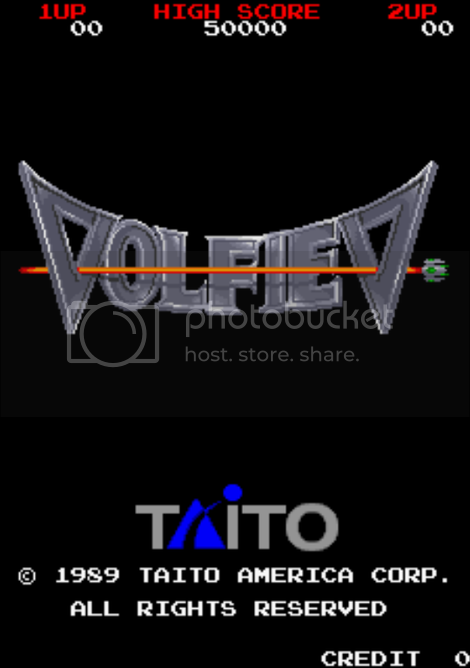 That game would come to be known as the arcade game Volfied, aka Ultimate Qix or Qix Neo. Ok, so maybe that was just a weird dream I had. Qix spawned several clones and variants including Microsoft's JezzBall, originally for Windows 3.1. The core gameplay consists of drawing lines via a ship that is only able to travel safely (for the most part) on the perimeter of the playfield. In each level, a large enemy moves, often erratically, through the playfield. The player must then venture into the playfield as they draw a line behind themself. Upon returning to the perimeter again, the space within the lines drawn will then fill in thus reducing the size of the playfield as well as altering its shape. This is made difficult by the increasingly cramped enemy who will instantly kill you upon touching you or your unfinished line. After capturing approximately 75% of the playfield, you complete the level.